(CNN) -- "Harry Potter and the Half-Blood Prince" made $22.2 million at its midnight showings Wednesday, setting a new record. 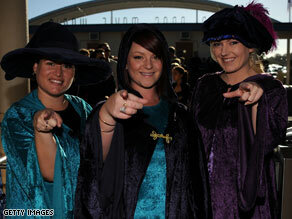 Actors are seen at the latest "Harry Potter" premiere on Sunday on the Gold Coast of Australia. The figure was released by Warner Bros., the studio that produced the film. (Warner Bros., like CNN, is a unit of Time Warner.) The previous record was held by last year's Batman tale "The Dark Knight," which made $18 million at its midnight showings. "Transformers: Revenge of the Fallen," which opened on a Wednesday in late June, grossed about $16 million in its midnight premiere, according to the trade paper Variety. The film had more than 1,500 midnight screening sellouts in the United States and finished as the No. 2 all-time movie for advance ticket sales at MovieTickets.com. The film finished just behind "Star Wars: Episode III: Revenge of the Sith" in advanced sales. "Harry Potter and the Half-Blood Prince" is showing at almost 4,300 theaters across the United States and Canada. The film is expected to gross more than $100 million this weekend and could match "Transformers" and "Dark Knight" by making more than $200 million total in its first five days. Despite the growing darkness, there's also a lightness to the new film, Radcliffe said. Unlike the previous two movies in the series, which were rated PG-13, this one is rated a more family-friendly PG. "I think this film's funnier," Radcliffe said. "There are a couple of moments which I laughed out loud at." CNN's Todd Leopold contributed to this report.